- Paul John Faeldo on 一月 9, 2017. Have you ever wondered what it would be like to 3D print yourself as an action figure? 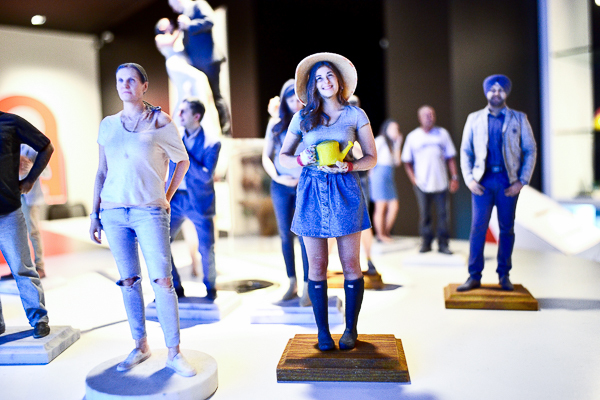 The Printing House (TPH) located in Downtown Toronto, on 66 Wellington Street West inside the PATH SYSTEM, has 3D Printing Centre where you can make a mini size version of yourself. Pretty cool, huh? During the holiday break, we had an exclusive experience at The Printing House’s 3D Scanning Studio. We had the chance to see their process on how they produce 3D Selfies and even participated by having myself 3D scanned to create a mini me. To showcase my fandom and my personality, I came in the studio wearing my San Diego Chargers hat, a black leather jacket, a Koop Shell backpack with red spikes, a red Street Fighter V hoodie, along with jeans, red shoes, and my ninja sword umbrella as my prop. Zachary Barr, from 3D Scanning and Business Development, was kind enough to walk me through their process. From that point, I stepped into their 360-degree photo booth, which took my picture using 120 cameras from different angles. Once captured, those images were stitched together to render a complete 3D image, which was able to reproduce a 3D printed figurine of myself. The type of material TPH made for me was made out of sandstone powder. If you are curious about scale, the standard production are 1:12 scale selfies. After receiving my “mini-me “figurine, I can’t express how amazed I was looking at the detail and likeness, from the texture of the jacket to the amount of details on my outfit (including the logo on my hoodie and the buckles on my shoes); just wow! At The Printing House, you can 3D print with all sorts of materials: ABS contains strong saturation color ideal for prototyping;. High-Temperature Polymer is for injecting molding; Rigid Opaque Polymer creates stiff, strong material ideal for demonstration; Simulated Rubber has a flexible texture; Sandstone Powder is produced with full CMYK colors with photo-realistic details like they did with my figurine. And, at last, Transparent Photopolymer, which is perfect for transparent projects that can be mixed/tinted with opaque materials to add color. I was even told that it is possible to make 3D printed food items like cakes and ice cream. Say what!? Coming from an animation background, even I was impressed. Whether you are an Industrial Designer, Engineer, Animator, Architect, Artist, or Medical Professional; you have endless possibilities to transform your ideas into the real deal. With the combination of your creativity and TPH’s facility, you can make anything. I remember a couple of years ago, my cousin with an engineering background, used the 3D software Solidworks, to make custom pieces of his cosplay costumes for conventions with his own 3D printer. If only he knew that he could simply have a 3D selfie of him in costume would have been pretty awesome. If you do not have a 3D printer but have a 3D model on file that you would like to be printed, TPH can provide their services to help you bring your ideas to life. It is also possible to make 3D prints just on image reference alone, but the time and labor would be far more expensive and the results not as accurate as the information that has to be interpreted and creatively guessed to fill those missing areas. It would be best to get scanned at the booth for better accuracy. Now that it’s holiday season,3D Selfies can also make unique gifts! They are great ideas to give to that special someone, capturing special moments and milestones such as birthdays, out of the box corporate gifts, and unique mementos for your children. This technology takes the evolution of photography to a whole new level. TPH(The Printing House) 3D is having a promo sale for $199 using promo code: HAPPYHOLIDAYS valid till January 31, 2017.